View This Newsletter On the Website. Happy Watermelon Day! Did you know August 3 is National Watermelon Day? I didn't. It's amazing the amount of holidays that have been added to our celebratory options. I love watermelon so I don't have a problem celebrating this one any day of the year. I was outside photographing a Spicebush Swallowtail Butterfly and a baby Carolina Wren flew right at me and stuck to my t-shirt. 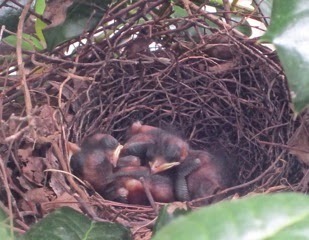 There were four (4) flying about as they obviously were enjoying their first hours out of the nest. So very cute. A bit of downy feathers for a special hairdo and that short little tail is so funny. What a blessing to be out there at the right time. 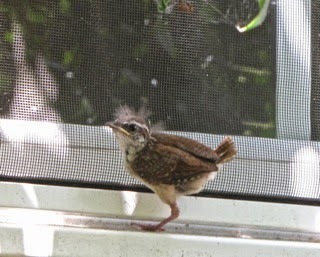 Speaking of baby birds ... what a treat to have a family of Gray Catbirds nesting less than a foot from the breakfast area window. A bit difficult for good pictures since holly leaves blocked a view of nest straight on. Shooting at an angle between the leaves and the window grille embedded into the glass leaves a milky shadow, but it was so wonderful to see the show and get some photos and videos. It's amazing how fast they grow when they hatch. They fledge (leave the nest) 10-11 days after they hatch and this crew were out of there early on the morning of the 10th day. They seemed so fragile and delicate. I have done a photo and video gallery for the pictures I took of this wonderful event. View Photo and Video Journal of Gray Catbird Nest. We have a lot of different bees here in our garden. God thought of so many little details to put into insects and everything He created. And of course even some amusing things, like fannies that light up on Lightning Bugs. I'm still a kid at heart when it comes to them. They are fascinating to watch in the back woods and for some reason we have a lot of them this year. We've also had a lot of really tiny bees this year. Many of them like the Black-eyed Susan flowers on the deck. They feed on the seed head along with the butterflies. 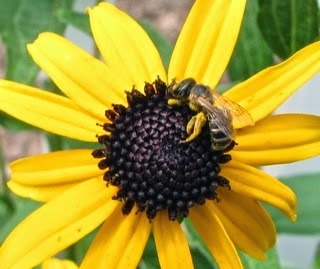 You can see this one has its legs full of pollen. Seems like it's time for a trip back to the hive. The American Goldfinches have been happy with the Black-eyed Susan blooms also since they love the seeds. Fortunately the squirrels haven't attacked the plants this year. In previous years they have tore them up pretty badly by jumping up into the big pots and pulling plants down to the deck so they can chew up the seed pods. (View Video of Squirrel Attack on Black-eyed Susans) We don't have that many squirrels this year. I think the hawk and fox have been busy campers. Talk about busy ... as I am typing this newsletter a young growing buck came into the backyard and shortly thereafter a doe was chasing him away. I knew why only a moment later when her fawn came up behind her. They look so precious with all those white spots and innocent behaviors. We are so blessed to be able to see some of God's Creation close-up every day and there's nothing more peaceful and joyful to me than that. 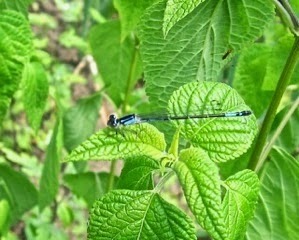 While gardening with my hubby one day, we saw a tiny little damsel flying about the Blue-Black Salvias. It was so thin and small (1.2 inches). I took many photos since it was darting from one plant leaf to another and I didn't know if any of them would turn out okay. Only one did, but very grateful for it. It's always amazing to me the incredible diversity of beauty God has put into the Creation He made for us to enjoy. What love He has for us! Last year we had a Green Mantidfly (Zeugomantispa minuta) laying eggs on the bottom of the square "globe" of our porch light. 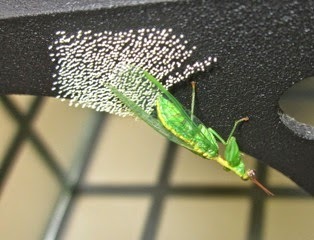 This interesting and rare to be seen bug is like a cross between a green lacewing and a praying mantid. They are only distantly related to mantids, but are instead related to antlions (known as doodlebugs as larvae), lacewings, and owlflies. On a side note ... Praying Mantids are actually cousins of cockroaches. They live throughout much of the Eastern United States and are found in a variety of habitats from late June through early October. They are nocturnal creatures so it was grand to be able to see this one busy about her business. They are considered beneficial since the larvae eats spider eggs and the adults capture and eat all kinds of small insects in captivity, but little is known of their food preferences in the wild. We love our spiders since they are bug-eaters also, so hoping our habitat will balance that out. I checked on You Tube and found a video of a Mantidfly (a different variety than the Green Mantidfly I photographed). It was quite interesting. There's also another video of the molting of their skin. It always fascinates me how bugs grow from shedding a previous "shell." Seems to take an awful lot of work to get out and move on. Check out the molting Mantidfly. If you live near Tuscon, there's a big Bird and Wildlife Festival that's taking place there from August 13-17. If you're going to be in that area don't miss Ramsey Canyon Preserve, a hot spot for hummingbirds. I'd sure like to be there but there are birding and wildlife festivals on our side of the country also. 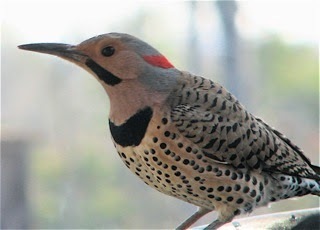 One that is in Virginia will be the Eastern Shore Bird and Wildlife Festival in October (10th to 12th). We've never been to that area of Virginia on the coast. Rather than go during the festival since slots for the best field trips are filled in quickly, I'm taking the information provided on those points of interest the birders will be visiting and we're planning on going a week later when things have quieted down. A great time to visit the beach since we will be passing by Virginia Beach to get there. Then there's Williamsburg on the way home where there are a lot of outdoor trails to explore. Check out the birding and wildlife festivals in your area and use the information to plan a trip for the beautiful Fall weather. Search site for festivals. Since we're on the topic of birding. I recently discovered that there is a blind birding group in Michigan and it would be nice if this type of training began to be available all around the country and world. I found groups in Texas, Idaho and Massachusetts, so it's beginning to spread. The foundation of it is to learn the bird songs and calls by ear. This is part of what birders normally do since there are birds you rarely see but can know by their songs. It has opened up a natural world to blind folks who can fall in love with birds and also learn so much more about nature and wildlife itself just by being out there. Check out this article about it and CBS video. 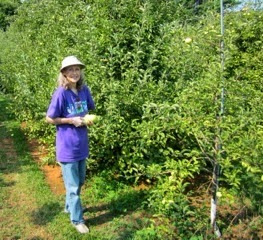 We went to a local orchard to pick a bushel of apples this past Tuesday. It was a beautiful day, rather chilly in the morning before it warmed up. We're having 58 degree nights here in Central Virginia. Strange weather. I love picking fruit almost as much as I love eating it. I like "shopping" local also, especially when it comes to farmers since they're having a rough time of it these days. On July 18th we attended one of Andrew Wommack's meetings in Woodbridge, VA. We were two hours away but have been to his meeting before and it's definitely worth the trip. In March 2012 I was prayed for and was healed of rheumatoid arthritis. There's been no pain/inflammation or more damage since which has been absolutely awesome! Some healings are not instant and those are the hardest to hang on to, but I am doing that now as I see things improving from what they were. He holds meetings across the country and there's an incredible time of worship before the message. Check out his website's listing of events. Spend some extended time with our Lord this week or weekend. He'll bless your socks off! Be still and know Him! P.S. Anything in here that might help somebody you know? Sponsored by The Herbs Place - Wholesale Prices Always - What's On Sale Now? © All photos unless otherwise noted are the property of Donna L. Watkins and cannot be displayed without approval. Do You Really Trust God? Can We Control Emotions and Feelings?